Our organization counted as one of the leading service provider engaged in rendering Bus Ticketing Services to our valuable clients. Widely appreciated by our customers, these services are provided by our experienced team members who are perfect in this field. Our prices are affordable and outstanding. New Mercedes Buses 52 SeaterMusic System, Video on Dvd and LCD, Leather Head Rest with Push Back Seats, Tinted Glasses, Super Cool AC. We allow you to book your ticket online with us and make your bus ticketing hassle free. Rajan Telecom Pvt. Ltd. holds the franchise with Pepsu Road Transport Corporation in Patiala. 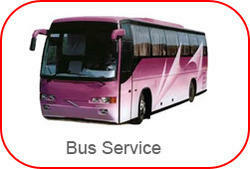 We will make arrangements for your bus tickets for travelling across India.